Sidney Albert Foltz, 95, passed away on February 17, 2019. Sidney, the son of Sidney and Katherine (Massa) Foltz was born October 20, 1923. He attended and graduated from St. Peter's High School in 1941, attended the University of Notre Dame, and graduated from the University of Virginia School of Consumer Banking. Sidney served in the US Army as an MP during World War II. He married Mary C'lette O'Hearn on July 26, 1947 at St. Joseph's Catholic Church in Canton, Ohio. They celebrated 67 wonderful years together and raised four children in their loving home. 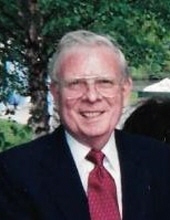 After working for two local companies, Sidney joined the Richland Trust Company in 1952 and retired in December 1989 as senior vice president. He spent numerous hours volunteering for church and community. Sidney served as president of Parish Council, Parish Lector and Eucharistic Minister, Stephen Minister, hospital visitation team, funeral choir, and co-financial chair for the St. Peter's annual festivals. He was also a life-long member of the Knights of Columbus 4th degree and a member of the Serra Club. Other areas of involvement have been the Junior Chamber of Commerce (Jaycees), co-chaired the 1958 Mansfield Sesquicentennial parade, United Way and Kiwanis. He received the George F. Hixson Fellowship Award, one of the Kiwanis International Foundation's highest honors. One of his favorite projects was over 28 years of service for the Special Olympics. Sidney is survived by his children, Sidney A Foltz III (Ann), Lynne (Steve) Ahern, Karen (Tom) Victory, Frederic (Merri) Foltz; grandchildren, Matthew Foltz, Brian (Jessica) Foltz, Beth (Ryan) Ahern Wells, Daniel (Rebecca) Ahern, and Emily, Christen, and Jonathan Foltz; great-grandchildren, Gavin, Landon, and Alayna Foltz, Haley and Mia Wells, and Xavier and Pax Ahern. In addition to his wife Mary Foltz, he was preceded in death by his parents Sidney and Katherine Foltz, sister Elizabeth Burnham and grandson Timothy Ahern. Friends may call at Herlihy-Chambers Funeral Home, 173 Park Avenue West, on Thursday from 5 - 7pm with a vigil prayer service at 5:00pm. Mass of Christian Burial will be celebrated 11:30am Friday at St. Peter's Catholic Church with Rev. Gregory Hite officiating, followed by military honors by the Richland County Joint Veterans Burial Detail. Burial will follow at Mansfield Catholic Cemetery. Memorial contributions may be made to the Msgr. Edward C. Dunn Foundation for Education or an organization of the donor's choice. To send flowers or a remembrance gift to the family of Sidney Albert Foltz, please visit our Tribute Store. "Email Address" would like to share the life celebration of Sidney Albert Foltz. Click on the "link" to go to share a favorite memory or leave a condolence message for the family.